(b) Legal documents related to mergers, consolidations, reorganization, receiverships and similar actions which affect the identity or organization of the company. (a) Service contracts, such as for operational management, accounting, financial or legal services, and agreements with agents. Until expiration or termination plus 3 years. (b) Contracts and other agreements relating to the construction, acquisition or sale of real property and equipment except as otherwise provided in (a) above. (c) Contracts for the purchase or sale of material and supplies except as provided in (a) above. Until expiration or termination plus 1 year. Until redemption plus 3 years. Until the securities are sold, redeemed or otherwise disposed of. Until discontinuance of use plus 3 years. (b) Paid and canceled vouchers, expenditure authorizations, detailed distribution sheets and other supporting data including original bills and invoices, if not provided for elsewhere. NOTE: All accounts, records, and memoranda necessary for making a complete analysis of the cost or value of property shall be retained for the periods shown. If any of the records elsewhere provided for in this schedule are of this character, they shall be retained for the periods shown below, regardless of any lesser retention period assigned. (a) Records which maintain complete information on cost or other value of all real and personal property or equipment. 3 years after disposition of property. Only current or latest records. Until expiration plus 1 year. Until expiration of coverage plus 1 year. (a) Claim registers, card or book indexes, and other records which record personal injury, fire and other claims against the company, together with all supporting data. (b) Claims registers, card or book indexes, and other records which record overcharges, damages, and other claims filed by the company against others together with all supporting data. (d) Reports, statements and other data pertaining to personal injuries or damage to property when not necessary to support claims or vouchers. (e) Reports, statements, tracers, and other data pertaining to unclaimed, over, short, damaged, and refused freight, when not necessary to support claims or vouchers. (a) Consignors’ shipping orders, consignors’ shipping tickets, and copies of bills of lading, freight bills from other carriers and other similar documents furnished the carrier for movement of freight. (b) Shippers’ order–to–notify bills of lading taken up and cancelled. (e) Other records and reports pertaining to ticket sales, baggage handled, miscellaneous collections, refunds, adjustments, etc. (d) Supporting data for valuation inventory reports and records. This includes related notes, maps and sketches, underlying engineering, land, and accounting reports, pricing schedules, summary or collection sheets, yearly reports of changes and other miscellaneous data, all relating to the valuation of the company’s property by the Federal Motor Carrier Safety Administration, the Surface Transportation Board, the Department of Transportation’s Bureau of Transportation Statistics or other regulatory body. 3 years after disposition of the property. Supporting data for periodical reports of accidents, inspections, tests, hours of service, repairs, etc. Supporting data for periodical statistics of operating results or performance by tonnage, mileage, passengers carried, piggyback traffic, commodities, costs, analyses of increases and decreases, or otherwise. Until revised as record structure changes. For the remainder of the period as prescribed for records destroyed. NOTE A: Records referenced to this note shall be maintained as determined by the designated records supervisory official. Companies should be mindful of the record retention requirements of the Internal Revenue Service, Securities and Exchange Commission, state and local jurisdictions and other regulatory agencies. Companies shall exercise reasonable care in choosing retention periods, and the choice of retention periods shall reflect past experiences, company needs, pending litigation, and regulatory requirements. Record retention is a vital part of any business. Size of business is irrelevant. You can own one truck or ten-thousand trucks; the law remains the same. Records of all nature need to be retained. The DOT Doctor offers record retention services for DQ files, drug testing results, financial data, company charters, maintenance, licensing, logbooks, dispatch logs and most other data. The DOT Doctor offers the option of hard copy storage services and/or soft copy data retention. Let the DOT Doctor keep you in compliance with easy storage and access solutions. §396.3 Inspection, repair and maintenance. (a) General — Every motor carrier shall systematically inspect, repair, and maintain, or cause to be systematically inspected, repaired, and maintained, all motor vehicles subject to its control. (a)(1) Parts and accessories shall be in safe and proper operating condition at all times. These include those specified in Part 393 of this subchapter and any additional parts and accessories which may affect safety of operation, including but not limited to, frame and frame assemblies, suspension systems, axles and attaching parts, wheels and rims, and steering systems. (a)(2) Pushout windows, emergency doors, and emergency door marking lights in buses shall be inspected at least every 90 days. (b)(4) A record of tests conducted on pushout windows, emergency doors, and emergency door marking lights on buses. (c) Record retention — The records required by this section shall be retained where the vehicle is either housed or maintained for a period of 1 year and for 6 months after the motor vehicle leaves the motor carrier's control. [44 FR 38526, July 2, 1979, as amended at 48 FR 55868, Dec. 16, 1983; 53 FR 18058, May 19, 1988; 59 FR 8753, Feb. 23, 1994; 59 FR 60324, Nov. 23, 1994]. Maintenance is a vital part of any fleet. A well designed Preventative Maintenance Plan allows a company to operate safe and well maintained equipment. This in turn saves the company money in repair costs, down time and fines while insuring that the equipment is ready for it's annual DOT inspection. The DOT Doctor can set up a PM program for your company with factory recommended specifications or by your company's specifications. We will maintain your maintenance records for one year or six months after disposal of the vehicle according to FMCSR § Part 393. This record will include a listing of inspections, maintenance performed, citations received, tests conducted and repairs. The DOT Doctor will set up a PM alert system that will automatically track and contact you when scheduled maintenance is coming due. You can set the notification interval. We can help you locate a service facility or even schedule service for you. 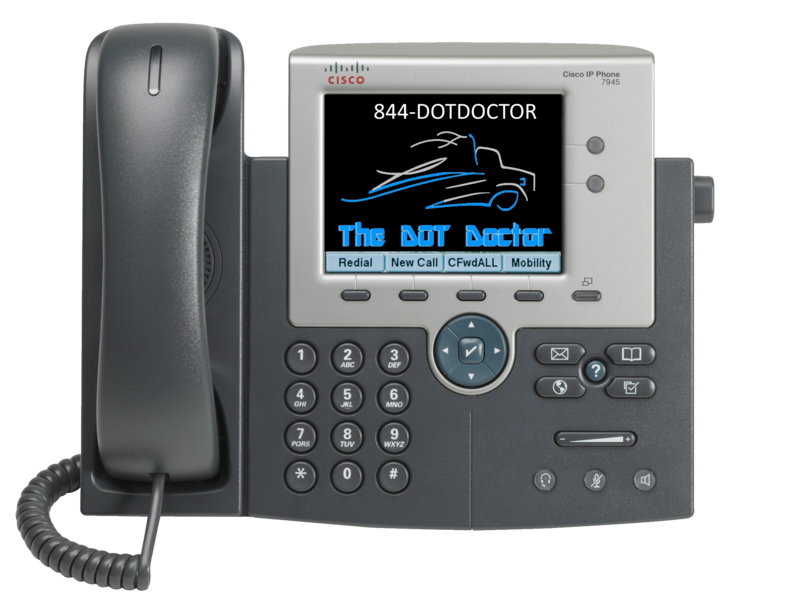 The DOT Doctor will cure all your maintenance ills and keep you in compliance. These services available by subscription or package services with one year minimum commitment. * Maintenance record retention with PM alert can be part of a full record retention package or purchased separately.